Everton earn a point in a 1-1 draw against Queens Park Rangers at Loftus Road. 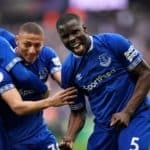 The Premier League bottom club QPR took the lead inside two minutes when Junior Hoilett saw his effort fortuitously deflect off Leighton Baines and past the wrong-footed, hapless Tim Howard. But Everton struck back through a Julio Cesar own goal to deny QPR their first Premier League win of the season. Sylvain Distin eluded the QPR defence to get on the end of a freekick to see his header ricocheted off the foot of the post and bounce off the back of goalkeeper Julio Cesar and into the net. 1-1. 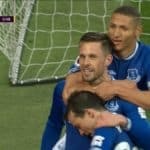 Everton should have been awarded a penalty moments later when Nikica Jelavic was brought down inside the area, with appeals ignored by referee Jonathan Moss. 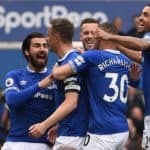 Everton suffered another officiating mistake in the second half when Moss sent off Pienaar with 30 minutes remaining following two yellow cards – the first blatant, the second wasn´t deserving of a foul, never mind a second yellow – a piss poor decision which rules the South African out of the Merseyside Derby. The referee was at the centre of attention again late on – this time refusing to award QPR a penalty for a foul from Seamus Coleman on Junior Hoilett. QPR pushed on for a winner against the 10 men of Everton, but Everton held firm to secure a point in the capital.